Eco-novice seeks easy, foolproof method of composting. There are multiple methods. Which one is the best for me? Note that I have actually ruled out worms because a couple of my friends tried that method and it seemed like a lot of work. I have a toddler. A crazy, gets-into-everything, I-cannot-control-her toddler. I need to be able to let her roam somewhat unsupervised in the backyard or I will lose my mind. We are also hoping to get a dog. I cannot have an amorphous pile of compost that my toddler or future dog will get into. I'm scared of attracting vermin. I've had ants, cockroaches, fruit flies, and rats. There are also plenty of stray cats and dogs in my neighborhood that I would like to stay off my property. I am completely willing to drop $100 to $200 on a compost bin if it will solve all my problems and make all my composting dreams come true. But I'm scared I'll buy a bin, and it won't work all that well, or won't make composting easy-peasy enough, and then I won't use it, and then I'll have a big hunk of plastic in my backyard and a lot of eco-guilt. What do you think is the easiest, least time-consuming, most foolproof method of composting? How do you compost? Do you use any special equipment? How did you learn how to compost? How long did it take you to figure out the method and make it work for you? Is it toddler-proof and dog-proof? What are you able to compost? How long do you spend on composting each week? Do you have to have multiple batches and how long does it take a batch to reach completion? What are the pros and cons of your method? What are the biggest challenges, if any, you face with composting? 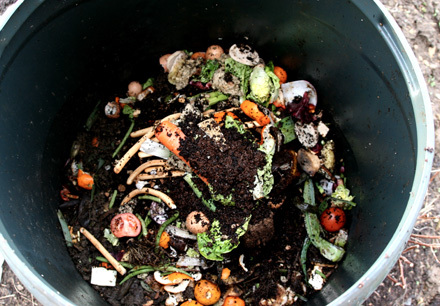 If you had to set up your composting system again from scratch, would you do it differently? Have you had any problems with vermin? Why not? What are your favorite resources (websites, blogs, etc.) for composting information? OK, you don't have to answer all of those questions, but any advice you would like to offer would be much appreciated. If you have a post about how you compost, feel free to leave your link in the comments. I would love for this post to serve as a useful compilation of composting tips and testimonials. 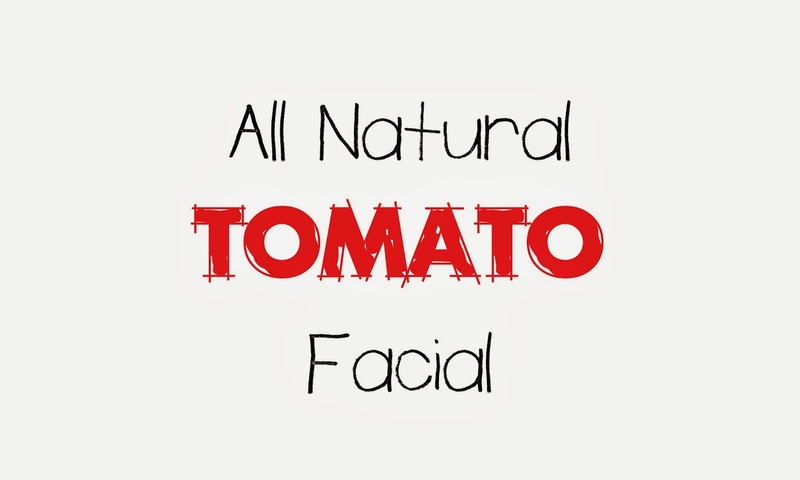 Mindful Echo admits that facial products containing tomatoes are probably great...But you know what's even better? The real thing! I can't vouch for the product itself, but I can say that it seems to have the right idea; that is to say: taking advantage of the beneficial properties of nature for skin care. I looked around and noticed a few other products with the same agenda. In particular, it seemed that tomatoes are the hot vegetable of the moment. Tomatoes are très chic, non? If you are using any tomato-based products at the moment, leave a comment and let us know how they're working out for you. In the meantime, I've been inspired to rediscover a fantastic go-to homemade facial recipe that allows me to take advantage of the abundance of produce I have on hand. That's it. That's all you need. No kidding. Next time you're making a salad or tossing together some bruschetta, just put aside the top, or any, slice of your tomato. On clean, make-up free skin swipe the pulpy piece of tomato across your skin. Leave it on for 10-15 minutes until it dries. Then, just rinse with water. Tomatoes have a natural astringent that will leave your skin feeling clean and refreshed. Plus, it's great knowing exactly what ingredients you're putting on your skin. Queen Composter shares her dishwashing dilemma. Recently our aged dishwasher suffered a slow and painful death, leaving me with a counter covered in dirty dishes. Actually, my counter is always covered in dirty dishes, but it felt worse because now I was going to have to wash them all by hand. We had to wait about three weeks for a new amazing Energy Star dishwasher to arrive and it was quite a challenge to keep up with it all, especially as there are five of us in the house, with some of us around full time, cooking and eating and making messes. I do realize that this is a first world problem and many people do not own a dishwasher. As we got closer to the delivery date I began to feel guilty about getting a new dishwasher. Here I was coping without one and I wondered how “bad” it was going to be to go back to my oh so convenient dishwasher. I decided to do some research into hand washing versus dishwashing machines. accomplished at stacking them to dry, Tetris style. However, dishwashers require energy to heat the water (newer models are cold water fill), to run the motor and to dry the dishes. The production of dishwashers requires materials and energy for manufacturing, as well as transport, servicing and disposal at the end of their lives. Hand washing only requires hot water and washing cloths. Assuming that one fills one side of the sink with warm, soapy water and one side with rinsing water, the amount of heated water required should be less than the amount of hot water for a load of dishes (ie: not continually running hot water to wash). Many people commenting on these articles argue that the amounts of estimated hot water to handwash are more than they actually use. 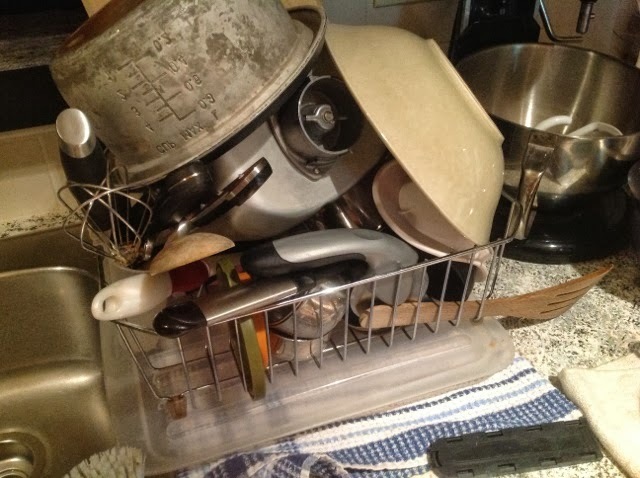 However, I personally cannot wash my dishes that efficiently and I am often left with food still caked on the dishes and pots. If I am being honest I would admit that I frequently run water while I wash dishes, especially with very dirty pots and pans. 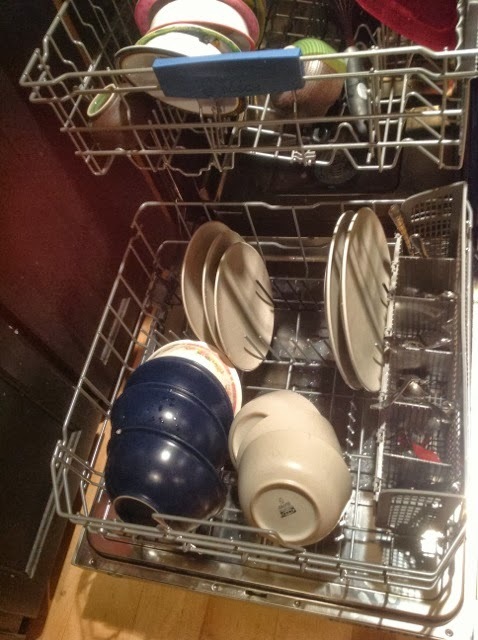 In the end our dishwasher arrived, and I happily went back to loading dirty dishes and unloading clean ones. Our new Energy Star dishwasher has wonderful eco settings and is whisper quiet, unlike our last one that made us feel like we lived next to an airport runway (which was a sure sign that it wasn’t very eco). Is it better than hand washing? I believe the jury is still out on this issue. Will I give up the convenience of my dishwasher? In the same way that I will not be completely giving up my vehicle in favour of cycling or public transportation, I will not be taking out my dishwasher. I can rest assured that I have made the most eco choice in dishwashers and that many "experts" support this decision. I hope that for now that is enough. What is your opinion of hand washing versus dishwashing? 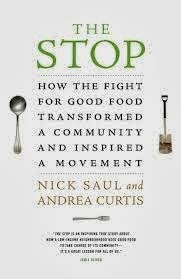 I just finished reading "The Stop: How the Fight for Good Food Transformed a Community and Inspired a Movement" by Nick Saul and Andrea Curtis. It has changed the way I think of Food Banks, poverty and hunger. Written by the (recently former) director of a Torontonian "Food Bank", The Stop is the passionate, inspirational and transformational story of how a food bank in Toronto became something of a food advocacy movement across the country. Like most people, prior to reading The Stop I had always regarded food banks as an essential component, perhaps an answer, to fighting hunger. Statements like: "Canadians waste one third of all food while thousands go hungry" felt logical in their pairing. As if one directly influenced the other. At the same time I had an inkling that food banks weren't really a great situation. I had heard often that the quality of food at food banks is often poor; processed foods, boxed dry goods, a lack of fresh food. And that the experience would be demeaning. But... I also had this (shameful) thought along the lines of "At least it's food". The book chronicles Nick Saul's journey through his beginning at the Stop in 1998, and the changes he brought to the food bank over the course of 14 years as the Director with a distinct personal feel. The book includes the challenges faced, the reality of poverty, food banking and hunger in Canada and around the world, and real people stories who frequented The Stop. What I thought was especially paradigm shifting, beyond confirming that living off of one food bank hamper per month just isn't enough, was the affirmation that "food isn't just food". I knew that food banking wasn't relegated to the homeless and that often, especially in larger centres, the concept of poverty and hunger could mean paying your rent vs eating. How do you choose between the two? Living in Halifax I can see that happening. Housing in the city is astronomically unaffordable on minimum wage. Although the further outside of the city you go, the more affordable housing gets... typically jobs are IN the city or require a vehicle. Public transportation outside the city taking up 45min-1hr minimum each trip at infrequent hours at a cost of over 70$ monthly pass is difficult- especially if you have children to feed once you get home at, 7pm... Never mind finding (and paying for) after school care. Just because a person needs a food hamper, doesn't mean they don't deserve to eat well. What I found so essential, and something that is often overlooked, was the change of referring to food bank frequenters to "members", allowing them a choice of food, having a clean (no mice and no mold) and a clearly defined space while treating members with respect. The Stop began accepting volunteer positions from local members, empowering their community. What they noticed, were tension decreased, community involvement increased and member conflicts decreased. Language shapes how we view the world. Beyond this basic human right of healthy food, it was fascinating to read about the tricky ethical situations that Food Banks find themselves in when dealing with large "Big Food" processed food company donors. The Stop has increased there connections and sources from local, when possible, organic farmers. Finally, what I found amazing about the Stop, was their strategy to poverty and hunger. 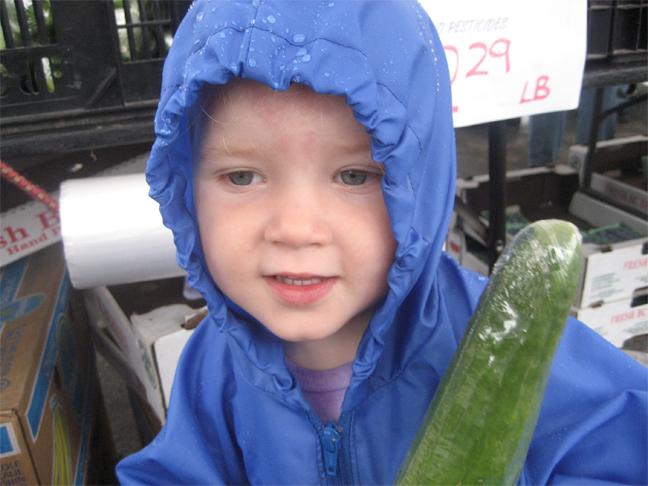 It went beyond creating a respectful, clean and healthier place to find food, to offering advocacy groups, having a community garden, encouraging members to volunteer, cooking classes, support groups... to a larger community farmer's market, fundraising and awareness building "Green Barn". It is flabbergasting. If you'd like to change the way you think of hunger, poverty and community food movements I highly recommend reading The Stop. It will rock your foodie socks. Here's another video from my organization, the Rainforest Alliance. This one shows the hidden consequences behind our purchasing decisions -- bringing to light the deforestation and habitat disruption caused by conventional farming of tropical agricultural products. What can we do to help? Pledge to look for certification seals like the Rainforest Alliance when shopping and pass this video on to anyone who might benefit from this message. If any readers live in New York City, the Rainforest Alliance is going to be in the Union Square Pavilion this Saturday. I won't be there, but there will be guest chef samplings, contests and staff to help explain the meaning of certification. For those of you not in New York, several RA-certified brands like Balance Bar and Yogi Tea are also offering discounts this week, which I wanted to pass on to you all. Mindful Echo travels sans cellphone. In my last post I extolled the virtues of my cellphone in terms of its helpfulness when it comes to useful apps for conscientious shopping. I openly admitted my dependence on the device. I declared myself a game-playing, text-typing, social media addict. I tempted fate. Only a few days after that post, my phone stopped holding a charge. It just up and died without so much as a goodbye. At the same time, my partner was out hiking with our dog when his own smartphone slipped through his fingers and into the lake. Despite emergency rice surgery conducted on the device, it was not to be recovered. I weighed the pros and cons between buying a new phone, switching contracts, and paying for costly repairs. Meanwhile, we were setting off for a few days of travel across Nova Scotia's South Shore and then back through the beautiful Annapolis Valley. It wasn't to be a huge trip - more of a staycation, really...except neither I nor my partner had ever explored these areas before. We were essentially heading into the great unknown without our trusted safety nets. We had to go about navigating the trip the old fashioned way: we had to use a map. To be honest though, it wasn't as bad as I had expected it to be. We didn't really get lost and I rediscovered my camera - although I did miss the convenience of having my iPhone ever-ready to snap a pic of my lunch and upload it to Instagram. 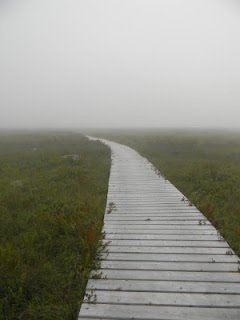 It also would have been nice to have a way for emergency communication as we hiked through the Kejimkujik National Park Seaside Trail, which was basically a haunted trail thick with the spookiest, densest fog I've ever seen. Just kidding. 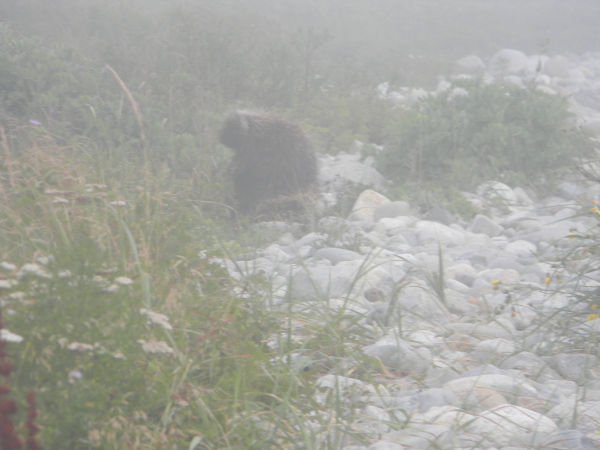 Ol' porcupine here just couldn't find any lunch amidst the fog. 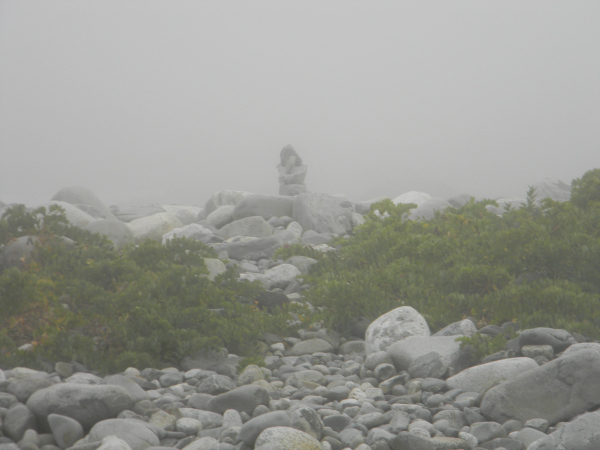 She just sits on the rocks, guarding the beach. Overall though, the ability to disconnect outweighed the convenience of carrying a phone. I could honestly be out-of-contact and truly give myself time to decompress away from the responsibilities of my work and social life. I would recommend leaving the house without a phone more often. Being without quick access to that technology better facilitates the state of mindfulness that most of us strive towards with our downtime. The ability to focus on the task at hand, without distraction or obligation, was was made this one a real vacation. Queen Composter shares the impact of living by example. Sometimes I worry that I am not explicit enough about the reasons for my actions, and that my views about living mindfully and being environmentally conscious are not clear to my daughters. Sometimes, however, we don’t need to be explicit and vocal because our actions speak louder than words. 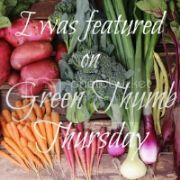 I am passionate about gardening, and as a newbie gardener who has so much left to learn, I am often reading about gardening, talking about my garden and spending time in my garden just walking around and observing everything. My daughters eventually follow me outside and wander around with me, asking questions about what I am doing. After watching me observing things and then coming inside and googling something I am wondering about, my girls decided that they wanted to learn more about the life cycle of ladybugs that were all over my plants, feasting on aphids. They now consider themselves ladybug experts and they delight in telling adults that ladybug larvae cannot be trusted. More importantly, they have learned about natural pest control, as well as respecting other garden pest predators like wasps. They also know the importance of bees because for a time my squash were not developing when they were not getting pollinated. 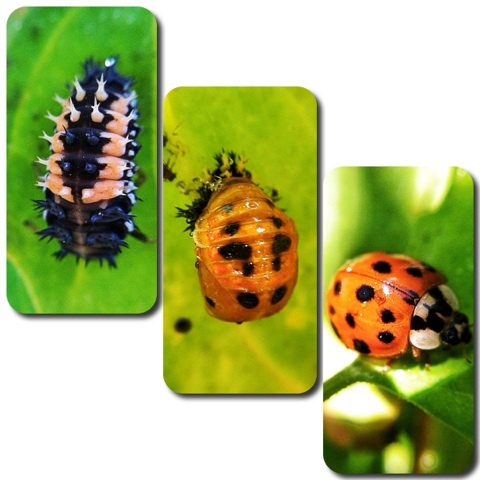 My girls love these images from our garden; ladybug larva, pupa and adult. This summer my daughters have spent a great deal of time playing “farmer”. They dress up in their farmer boots and wander around my garden wearing their garden gloves, with their toy wheelbarrow and shovel. I realized I needed to give them their own gardening plot to plant seeds and really be farmers (I am a little bit controlling about “my garden”). They are so proud of their garden and want to know if the food at our table is from their garden bed. 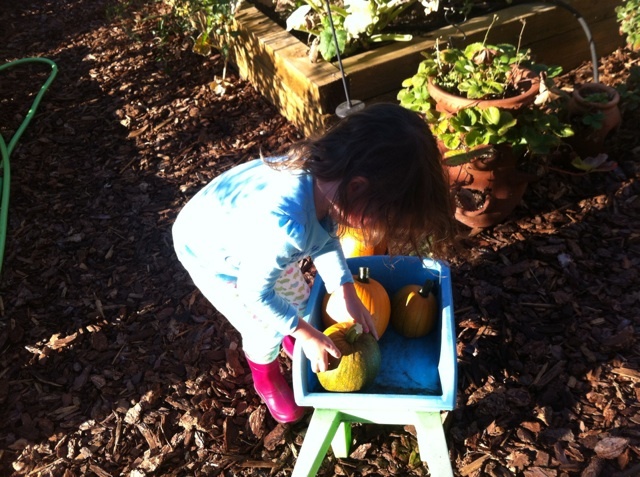 They now feel like stewards of any seeds or little plants they find and are forever planting seeds in any available dirt. My little farmers (see their boots?) 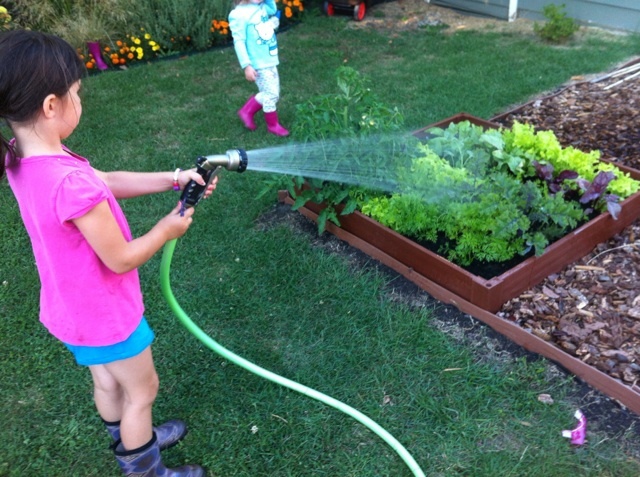 are watering their garden. I believe in the power of modeling to change behaviour because it does not involve preaching, it involves doing. Children do not have to listen, they just have to watch, which is much easier to process. 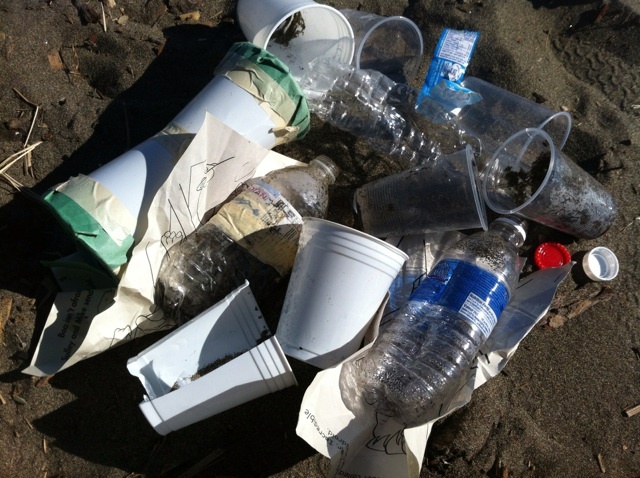 This summer at a local beach we watched a large group leave garbage all over. I began picking up the plastic cups that were strewn about, and after watching me, my six year old ran down to the water’s edge to pick up plastic water bottles and cups that were starting to float away. She ran back to me with her cache and said that she was so worried about the animals in the ocean getting sick or hurt by the plastic. Sadly, we found all this in five minutes. This world does need vocal advocates and activists to inspire people to make change. We need people like David Suzuki to lead the climate change battle to convince corporations and governments to take action. If we want the next generation move beyond our rhetoric and take action, however, we need to live mindful lives now. Never underestimate the power of modelling. Julia from Color Me Green compares bicycle infrastructure in Portland and Brooklyn. When I got here, I quickly realized why people like to bike: 1. It's not too hilly; but more importantly 2. The streets are extremely quiet, as in devoid of cars. Seriously, every time I rode down a street in Portland, I was amazed at how pleasant it was. I'm used to biking in New York City, which is mentally exhausting in order to avoid cars and pedestrians. In Portland, it's relaxing and delightful as you pass by adorable houses and gardens on quiet side streets. 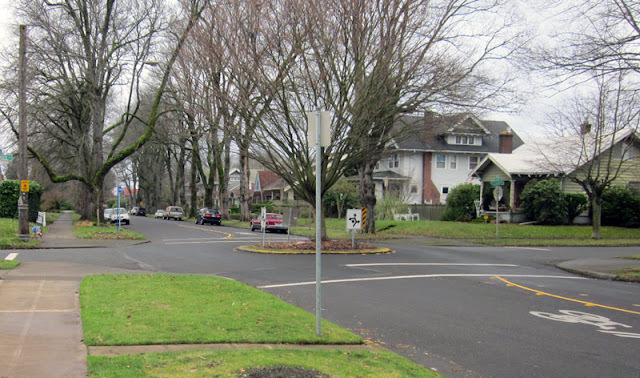 Portland has actually facilitated this by designating certain streets as "bike boulevards" with 20 mph speed limits, speed bumps, stop signs, and traffic circles in the middle of intersections, which cause cars to slow down and eliminate lefthand turns. These barriers discourage cars from taking these roads, which frees them up for bikes. Instead, cars take streets that run parallel to bike boulevards with higher speed limits and stoplights. Bike boulevards go a step beyond bike lanes and traffic calming - not only making streets safer, but also healthier, since you're not riding next to vehicle exhaust. It's important to note that slower and fewer cars makes streets safer for pedestrians, as well. I think this works well in Portland because the population density is just right. The number of people and hence cars is low enough that there don't need to be cars on most streets at any given time, so cars can stick to certain streets. Yet, it's dense enough that it's feasible for people to walk or bike short distances, also reducing driving. I don't see this strategy working in New York City, which has traffic calming measures in place to slow cars down, but too many people and cars to actually keep vehicles off certain streets. (Portland covers nearly twice the size of Brooklyn with a quarter of the population.) Feel free to disagree with me, though. I'm sure there are other small cities or even downtowns of large towns where bike boulevards would help make transportation more bike-friendly. Could you see this working where you live? Does your town have any bike-friendly infrastructure in place? * Interestingly, the 6% of Portlanders commuting by bike equals about 18,000 people; and while it sounds meager that only 0.8% of the NYC population bike commute, that's actually 30,000 people (source). 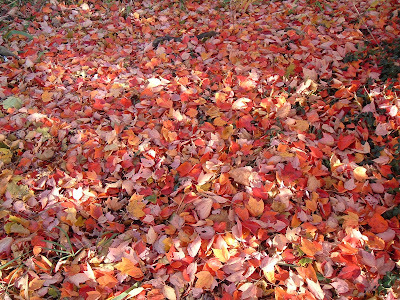 The Climate Crusader is thinking about how to stay green as the world around us turns to reds and golds in the autumn. With Labour Day upon us, the unofficial end of summer is here. Vacation time is over, and my kids are starting school tomorrow. Sometimes it feels easier to be green in the summer, with a more laid-back schedule and more time spent outdoors. My principles are put to the test once I get back to the swing of things in September and find myself driving more, packing school lunches every day, organizing activities and facing colder weather. If you can relate, here are a few ways you can keep your lifestyle green, while the world around you starts to show off those fall colours. If you visit the local farmers' market right now, you'll experience the bounty of the harvest. All too soon, though, that bounty will start to fade away. 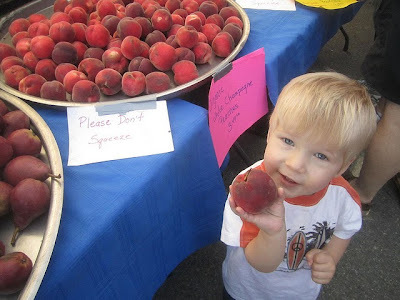 You can continue to enjoy the summer's fruits and veggies all year long, though, if you do some preserving. If you've never tried canning before it can seem intimidating, but if you give it a go you may find that it's both easier and more fun than you expected. If that's too much for you to start with, you can freeze some green beans, dry some herbs, or pickle some cucumbers. For newbies, I highly recommend the National Center for Home Food Preservation website, which has instructions for pretty much any kind of preserving you'd like to do. 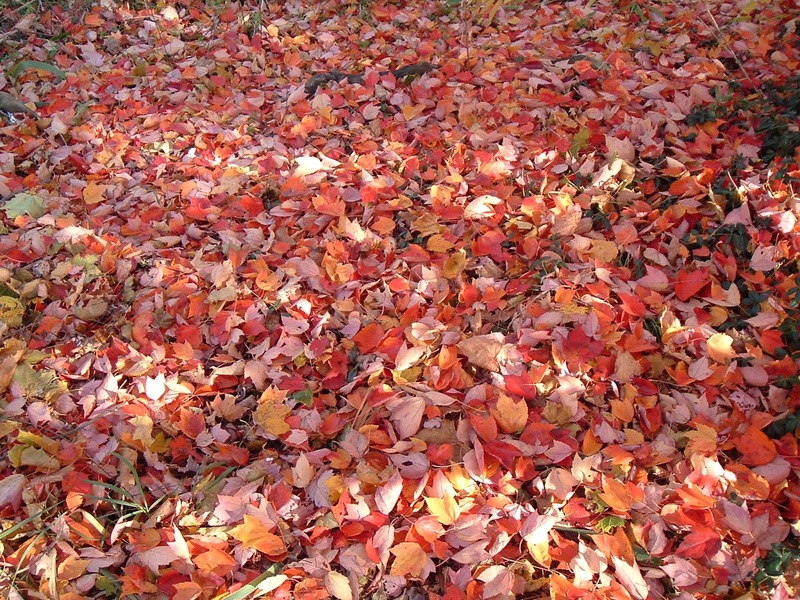 As autumn arrives we stop worrying about cooling our homes, and start worrying about heating them. One great way to reduce your environmental footprint at this time of year is to turn down the thermostat so that your furnace is running less (or not at all). If you're cold, you can follow your grandmother's advice when she said, "Put on a sweater." In fact, great sweaters are one of the best parts of fall. If you don't have enough warm clothing, hit up your local second-hand shop. The bonus is that by shopping second-hand and turning down the thermostat, you'll be saving money, too. My daughter is one of those kids who loves extra-curricular activities. She's willing to give almost anything a go, and she enjoys being active. If I didn't limit the number of classes and clubs my kids participate in, I could easily find myself driving all over town every weekday, dropping off and picking up and trying to eat when I can. This isn't only expensive and stressful, it's not exactly great for the planet, as we burn a lot of fuel and find ourselves picking up fast food just so that everyone can get dinner in the mad rush. Also, kids miss out on the opportunity to explore their imaginations and play outdoors when all their time is structured. Set limits on activities, and keep the season sane. Okay, okay, I realize I'm sort of jumping the gun on this one. At the same time, the holiday season will be here before we know it. If you'll be shopping second-hand or making gifts, you'll need to plan more time for preparation than if you're just heading to the mall. The earlier you start, the easier it will be, and the fewer last-minute gifts you'll have to buy when you realize there's just no way that you can re-purpose three sweaters into homemade stuffed animals in the next 12 hours. Ditto for Halloween. If you want to make your own Halloween costume, now is the time to start thinking about it, because I can say from experience that staying up until 1:30am the night before is just not a whole lot of fun. What about you - how do you keep green as the days cool? Share your tips!